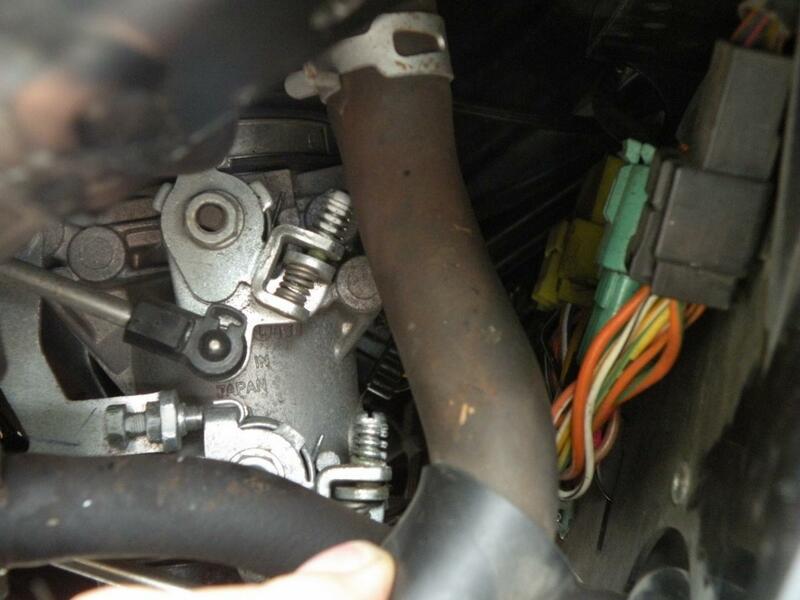 Stromtrooper Forum : Suzuki V-Strom Motorcycle Forums > Popular Forums > DL1000 from 2002-2012 > 02-12 1000 TB synch with pics and write up "thanks Yarz1"
02-12 1000 TB synch with pics and write up "thanks Yarz1"
How do I adjust my throttle bodies? 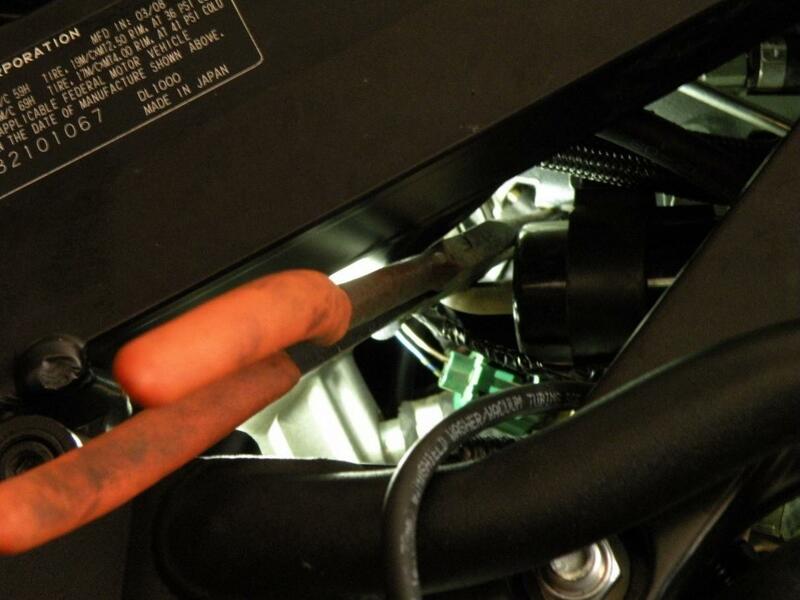 The vacuum ports on the throttle bodies are hidden and buried from easy access. The first step I was told is to attach extension tubes to the vacuum ports (one per throttle body) and get them to hang out the right side of the bike. 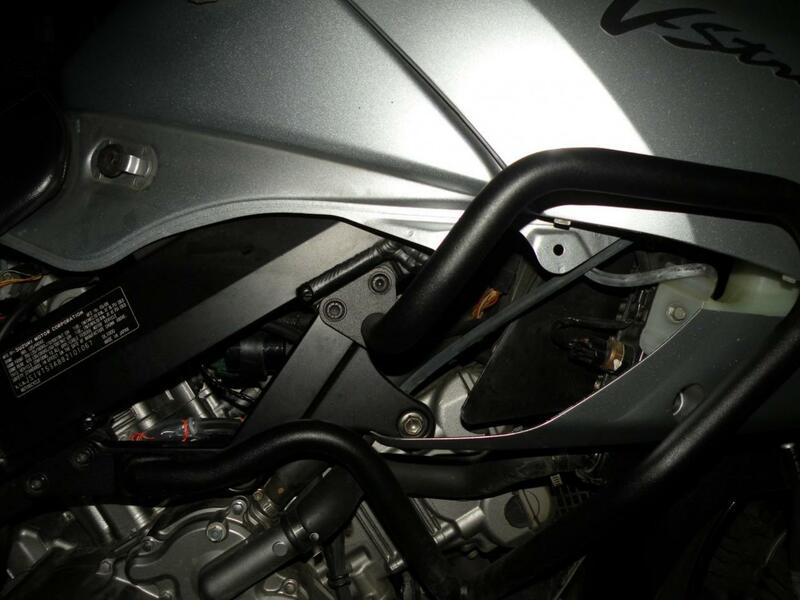 To access the front throttle body vacuum port, with flashlight in hand, lay down beside the bike on your back and find the throttle body. The look for a capped port. It is a short brass colored tube sticking out about a half inch long with a black rubber cap over it. 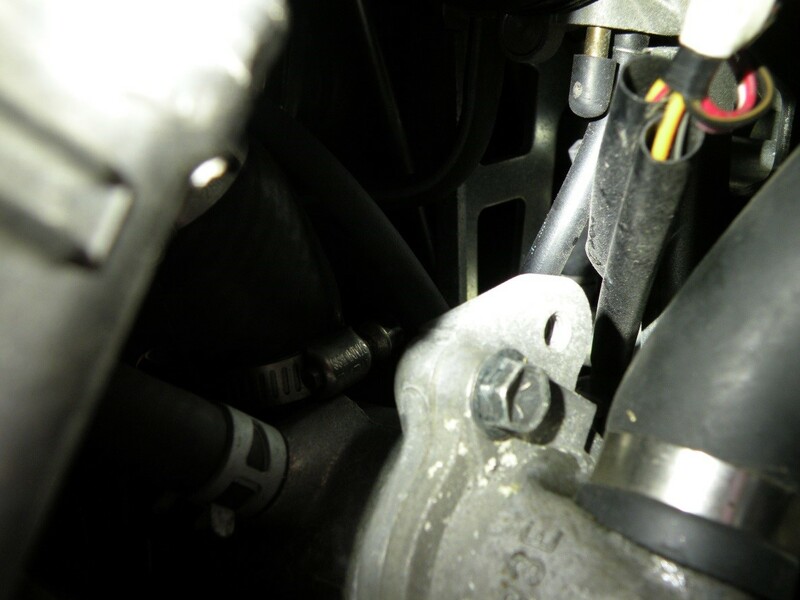 The vacuum port you seek is, in this photo, sticking straight down and is seen just above the thermostat housing. I was able to reach my hand all the way up there and work the rubber cap off. Save the rubber cap! 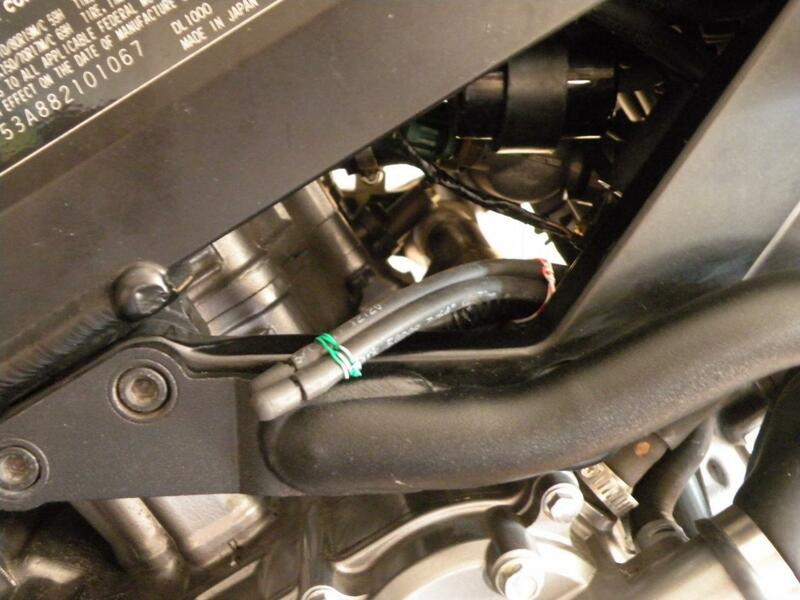 According to the information in those aforementioned on-line resources, the hose that you are to put on that port to extend out to the right side of the bike is 5/32 of an inch inside diameter. I bought some at the auto store and it slid on and off that vacuum port too easily. I went back and purchased vacuum hose with an I.D. of 1/8 inch. It was tougher to get on the port but I felt more comfortable that I would not have vacuum leaks since it was a tighter fit. Here you can see a bit closer up of the vacuum port. Once I got my hand up there, it took a few minutes to work that rubber cap free from the vacuum port. Just work your extension hose back on to that port and feed the tubing out to the right side of the bike. Ta-Da. The front cylinder is done. The rear cylinder is slightly more difficult. You can see the port in this photo. It is hidden quite well but visible as a brass colored tube pointing straight down with a black rubber cap on the end. You can see it just above the green colored wire connector. I had enough room to slide my right hand in and just barely reach it with my finger tips. I had no leverage to get the cap off. Remove the “L” shaped side plastic panel on the right side of the bike just below the seat. This will open up a better view venue. With my fingers of my right hand on the cap, I used a long skinny screwdriver in my left hand to slowly and gently pry the cap off of the vacuum port tube. This photo shows the rear cylinder vacuum port from the right side of the bike a bit closer up that the previous photo. When removing the cap, remember to save that cap for later use. This side is much more difficult to maintain control of the cap as it is being removed. Thus, I pried with the screwdriver in a very slow and gentle process. Once the cap is off, attach your hose. OK, here’s the really tough part. There is very little leverage to help in sliding that tight fitting hose onto the vacuum port tube. It HAS to be done, so take your time and stick with it. I fed the extension tubing in from the bottom front of the engine so that it would intersect with the vacuum port tubing in a straight line. I then use my right hand finger tips and a pair of long pliers to work the extension tubing on. It seemed to take about a half hour just to get that tubing to get on and slide up to cover that half inch long vacuum port tube. Once I got the extension tubing on, I fished the end out the right side of the bike. You can see it hanging over the engine guard in the forefront of the photo. Now that your extension tubing is hanging out the right side of the bike, trim it to a length you want. This will allow you to do future synchronizations by connecting here. 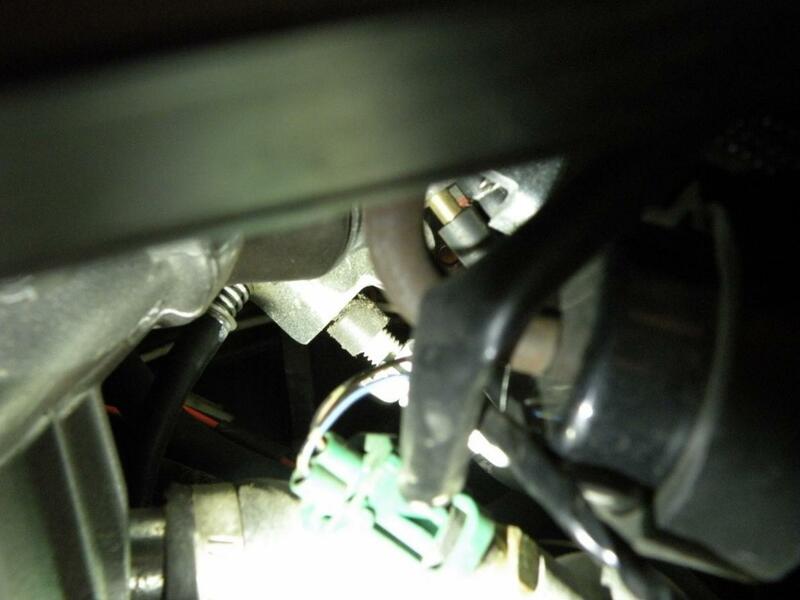 Into the ends of the extension tubing, you need to insert a straight connector and then cover that connector with that black rubber cap you saved when removing it from the throttle body. I’ve secured my extension tubes together and now have them tucked right there behind the frame. To locate the synchronization screw, I removed the black plastic insert from the right side plastic panel (not the entire panel). But I’ve been told removing all of the plastic makes life easier doing this. If my engine guard was not in the way, you could see the front throttle body right through there. There is sufficient room to reach all the way in with my right hand and grasp the screw. I was able to move the screw with my thumb and middle finger of my right hand. Plenty of room to get my hand in there and still stay away from anything hot. With the black plastic insert removed from the side panel, you can see the throttle body synchronization screw. The screw you seek is the one that points straight down. Of the three screws in the picture (one about 1:00, one about 4:00, and one about 9:00), the sync screw is the one that is at the 4:00 position in this photo. It is located just above my thumb partially seen in the photo. Before doing any adjustments to the synchronization screw you need to have a manometer at the ready. Warm the bike up to normal operating temperatures. Set the idle to 1,200-1,400 rpm (be sure to remember to return the idle setting to it’s original setting once you have completed your synchronization procedure). 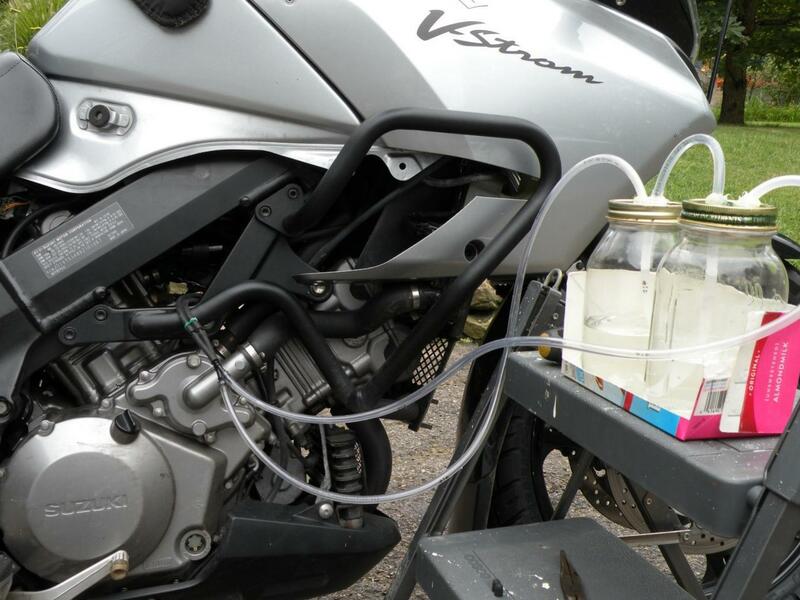 Then connect your manometer to the extension hoses sticking out the ride side of your bike that you just put there. No manometer? Making one is rather simple. I used the aforementioned on-line resources to see how it is done. 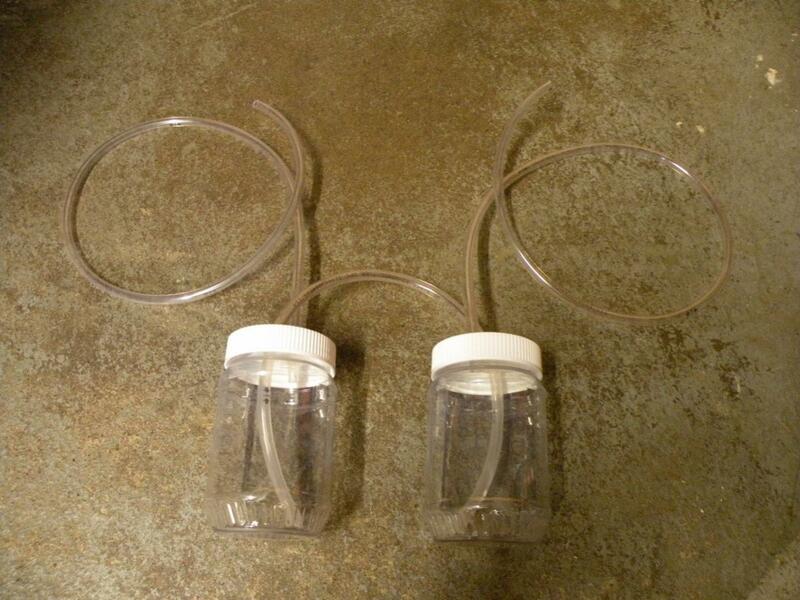 I used two one-quart glass mason canning jars and some vacuum tubing from the local hardware. The quart volume gives you time as they don’t drain or fill all that fast. If you use containers smaller than quarts, the containers will exchange the fluid at a faster rate. I drilled holes in the container lids slightly smaller than the O.D. of the vacuum tubing. I fed the vacuum tubing through the holes and then added silicone around the holes just to ensure I sealed everything from a vacuum leak. The tube that goes from one container to the other needs to reach to the bottom of each container. The tubes that lead from the containers to your throttle body sync extension tubes you put on the bike need to reach only into the container enough to be secure. 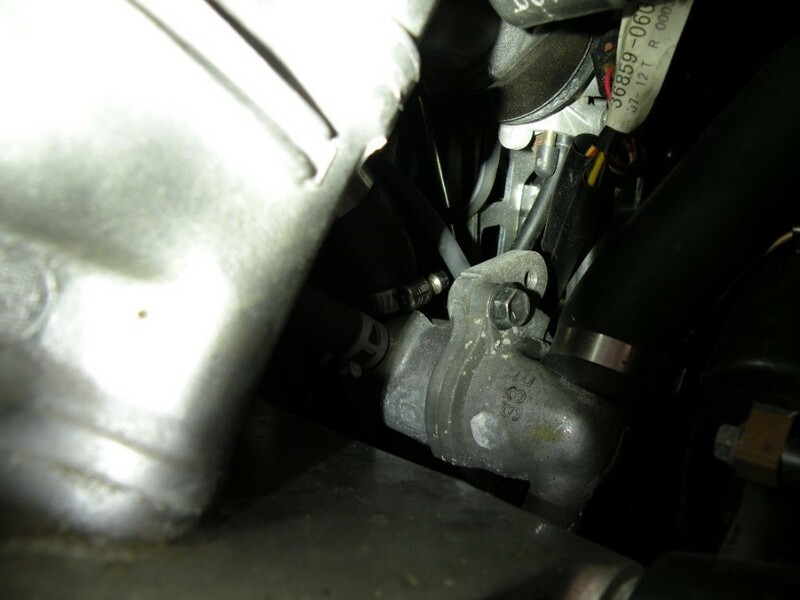 Keeping these tubes high enough out of your fluid of choice eliminates, or greatly reduces, the chances of said fluid being sucked into a throttle body in the event your vacuum of one throttle body is significantly different from the other. To be sure, when you add fluid to the manometer, fill only one to a point the fluid is below that vacuum line and then just dump half into the other container. That way you know that if all the fluid ever gets transferred into one container that it can not be drawn into the throttle body. So it is not fancy nor expensive. You can see the line between containers reaches the bottom of each. The lines that go to the bike just reach inside the lids. So, once the bike is warmed up and idle set at 12-1400 rpm, turn it off. Connect the manometer. It helps if you connect the first container to the first cylinder throttle body extension tube and the second container to the second (or rear) cylinder. That way, turn the screw clockwise to fill the first container and counterclockwise to fill the second container. 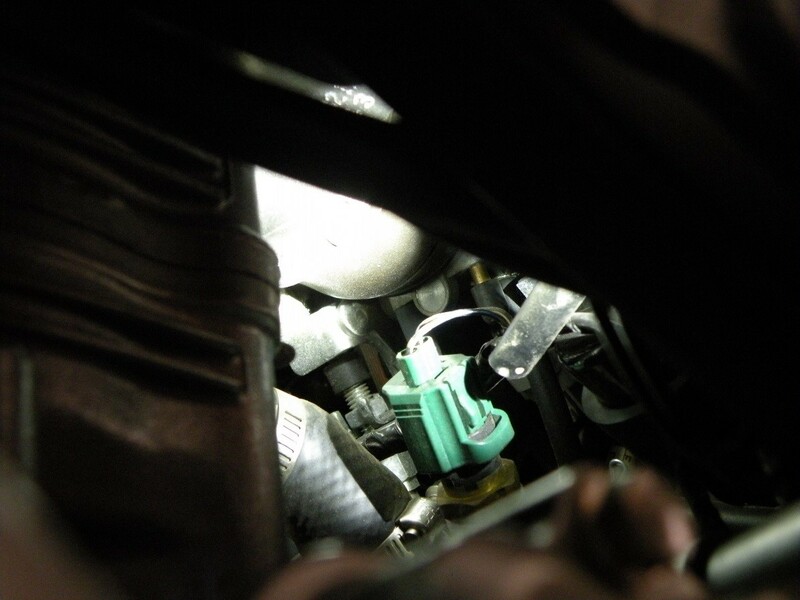 It only takes minimal movement of the sync screw to change the fluid levels. Once you get the fluid levels even, blip the throttle. Wait. If the fluid levels change, adjust the screw. Some on-line resources mention using a screw driver or long pliers to adjust the screw. I removed the black plastic insert from the right side panel (see above). This exposed the screw and allowed me to reach my right hand in there. I thought it would be hot but even with the engine gauge showing three bars, it was not a problem reaching in and adjusting the screw by hand. Here’s a photo of my manometer attached to the bike. Jar #1 was cylinder #1. I turned the screw a minimal amount to fill a jar if the fluid was being sucked into the other jar. Turning the screw Clockwise filled jar #1, and turning it counter- clockwise filled jar #2.